How to conduct a concert: I saw some best practices yesterday. 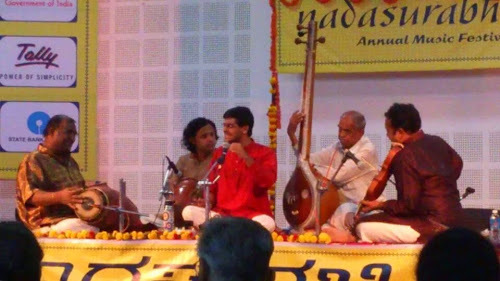 Nadasurabhi, well known for the free concerts in and around Koramangala over the years, are celebrating their annual festival (free concerts) again. Yesterday was Ramakrishnan Murthy with HN Bhaskar, HS Sudhindra and Giridhar Udupa. Braving unseasonal Chennai cyclone-inspired heavy day-long rain, armed with big umbrellas, my 86-year old rasika neighbour and self arrived at the venue 30 Min before 6 PM. Signs placed at several places led us to the Nursing School auditorium, built to last long and give many enlightening experiences to students and general public. All the organising committee members were in full strength, welcoming us with smiles. The mike wires were hidden away and the mike man was stationed just in front of the stage on the side. The speakers were not a dirty eyesore with muddy looks. The hall has excellent acoustics and ambience. The plastic chairs are of janata quality but decent in appearance. Each row holds nearly 25 people. Well located and clean toilets on the wings are helpful to those who need a recess. The Sabha staff stationed themselves and stayed on till the end. The flower bouquets were handed upfront and a minimalist speech was made introducing the artistes. The crowd of around 150 despite very "dampening" weather spoke of the artistes' attraction and the sabha's reputation. There was the arati plate, also done quietly. There was a request for donation, done respectfully. There was a membership drive done in a dignified way. All done with no clamour or tamasha. The mike man tweaked the volumes within reasonable limits quickly. No interventions were later necessary. The stage lighting was good and the audience were also clearly seen by the musicians. I congratulate Nadasurabhi for getting so many things right. (Next time, please place flower bouquets after unwrapping the plastic). For a Sabha of this high standard, I will gladly pay for tickets. The brilliant concert of RKM, from Dakshinamurthe to Venkatachalanilayam, from Shankarabharanam to Saranga to Kharaharapriya to Begada to Varali, from Sogasu juda to Kandu dhanyanade, deserves a long report befitting the 3 hours of musical bliss that we experienced, and the audience thoroughly acknowledged it, by repeated applause. Perhaps emulating Abhishek, RKM sang some brilliant ragamalika swaras after the Varali RTP. Athana, Bahu dari, Behag, Kapi, Suruti swaras sung in slow speed forward and backward order, and then second speed in forward and backward order. Sudhindra was a tad jarring a few times, but thoroughly relished accompanying the artiste. The Tani with Udupa after KHP was done very well and he played for the pallavi and swaras extremely well. He also anticipated and accompanied the niraval portions adroitly. Bhaskar was particularly good in Tanam and Saranga alapana as well as Sindhubhairavi. And today is Abhishek with more Varsha! I agree with RSachi.Extremely dignified appearence by office bearers.Mr.Raghavan very ably conducts the concerts each year.I wish more people join as life members which will perhaps increase the corpus.Of course there is a donation drive and looks significant people have contributed-as per the annual booklet .The annual booklet is also well brought out listing the activities of the entire year.The auditorium is good and has good accoustic system. I was extremely happy to read about the excellence of event management. I am planning to attend Sangita Kalanidhi RV's concert. If you also planned to attend, we will have opportunity to meet for quality time. Sure sir. Will try to be there. For those who wants to know, this is the list of kritis sung..
On 16th, during Vid.RV's concert, audio/sound systems gave lots of problems. Anoor was frequently seeking changes and adjustments, with his trained and highly sensitive acoustic hearing. Other artists simply focused on the quality of music. Height of misdemeanor was the sight of the sound systems technician resting and sleeping on the systems, completely unaware of the request of Anoor Naada Surabhi event management team also did not intervene . Testing and balancing before a concert begins is a must. It was not done. This aspect has to be followed religiously. Sir, yes I also saw a lowering of standards of audio setting for Abhishek. Then on Saturday I went to the Bose Hindu "Jasrangi" of Ashwini Bhide and Sanjeev Abhayankar. The audio was OK but lacked "warmth" as stated by Sanjeev. The huge hall at Good Shepherd had a somewhat uncomfortable seating at the back. The funny thing was that they had multicoloured lights as a backdrop to the artistes and the colours were changing with the music! Not really my cup of tea. On 16th morning there was nothing wrong with the sound system. There was repeated request from AAK Sharma to increase the volume for mridangam, but in order to adjust it to the soft voice and low pitch of Dr. Vedavalli and also to make her voice audible, the sound system person purposely didn't raise the volume of mridangam even though he pretended to do so. First action is to have a perfect balancing. Which was not even attempted. It was being done as the concert was progressing. Anoor desired optimization of both the right and left sides of the mridangam, which was not done. Feeb back was also deficient, as the artists struggled get the good feed back. When request was made to adjust the volume of the mike of Nada Surabhi RV for clarity, it was not done. Systems technician wanted the mike to be moved closer to RV. How come none got disturbed at the sight of the systems technician snatched a quick sleep resting on the system, unmindful of the Anoor wanting his attention? I desired to point this out for the preventive action. One can not deny the fact the cultivated habit of desiring unnatural high volume by the artists, as part of method to compel the quick fix appreciation and applause in the present times. Rasikas, with few exceptions, seem to enjoy this trap willingly! Fact is when the music is pure and chaste, all these issues do not engage the minds of the rasikas, as it was on RV's concert, during the concert.